0838 Honey (Pa-kistan). Wishes to buy about $10,000 worth of pure and natural honey. sellers option of wheat flour, specifications per Damascus contract No. 1/79. Damascus. Phone: 111021, 113201, 113302, or 118398. Shibli, Manager, Darwish Trading Company, P. 0. Box 92, Doha, Qatar (Arabian Gulf). Phone: 328714. Telex: 4298 TRADER DH. July 1979. Quotations CIF Valpariso or FOB U.S. port. Bank ref: Banco De Chile. CASILIA 1977, Santiago. Telex: CL CCU 40437. Consul General, Urbanstrasse 7,7000 Stuttgart, Federal Republic of Germany. Johannesburg. Contact: M. A. Horn, Managing Director, Cecil M. Simon and Co.
(PTY) Limited, P. 0. Box 10725, Johannesburg 2000, South Africa. Cable: CECILSIM. Telex: 8-0987 SA. Phone: (011) 21.7731.
vegetable production. Water available in abundance. Needs services of consultant. 66,000 birds. The managers wish to expand poultry farm to 150,000 birds or more. managing poultry farms abroad. Terms and conditions of partnership are negotiable. Economi Co., P. 0. Box 1639, Riyadh, Saudi Arabia. Cable: ALAKHAWAINCO, Riyadh. Telex: 201186 AKWANCO. Phone: 23528. 0859 Canned meats (Egypt). Seeks connection with U.S. suppliers of canned meats. 92765 RAHIM UN.ATTN: Yosri. Phone: 924387.
weight for human consumption. Requestor is distributor of general merchandise. Represenaciones Sudamericanas, Casilla 5407, Guayaquil, Ecuador. Phone: 516-337. 3746 HOYU J. Phone: 052-682-1761. 0853 Freeze dried beef (Japan). Wish to contact suppliers of freeze dried beef. Riflavournoid (lemon and orange). Bank ref: Nedbank, Industria. Contact: P. C.
1774445 BASAME. Phone: (905) 512-7401 and 521-4613. Foreign Purchasing Committee, 24, Gomhoria Street, Cairo, Egypt. office: 84240 ATTN: Tony Levenstein. July, August, quote FOB U.S. port. Bank ref: First National Bank of Boston. Contact: Carl Dolega, Canale, Martin Garcia 320, 1165 Buenos Aires, Argentina. Telex: 18951 CNALE. Cable: CANALE. Phone: 265000. Sheriff Street, Dublin 1, Ireland. Phone: 740926. Telex: DUBLIN 5197.
white peas, 1000 mt green beans, 500 mt green lentils, 100 kg bags, 1/4 lb. sample required, shipment Khorramshar, Iran. Bank ref: Royal Bank of Canada. Ontario KIG 3TC, Canada. Phone: (613) 731-4621. Telex: 053-3198. Stanmore, Middlesex, England. Phone: 01-954-7896.
quality BP or equivalent, in drums about 200 kilos net. Quote CIF and C&F. Gerrards Cross, Bucks SL9 7BR, England. 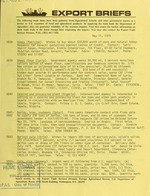 Telex: 847777 DELRAY G FRIEND 500. Service GMBH, AM Lunedeich, D-2859 Bremerhaven, Germany. Telex: 0238738.
chocolate, initially samples required for evaluation. Quote CIF U.K. port. Eastcheap, London EC3M 1AJ England. Telex: 886093. Phone: 01-623-8984.
a 68 and 124 percent increase, respectively, from 1977.